A great way to personalize your wedding rings is with an engraving on the inside of the ring. deBebians offers this engraving service on all our men’s wedding rings and on select styles of our women’s wedding rings. The engraving is performed by our in-house engraver who uses a computerized machine with a diamond tip to etch out the message in a Helvetica or script font. The process is quick and will not delay your order. The size of the ring — width and finger size — determines the space available for your message. Men’s rings are ideal for this type of personalization, because they are wider and typically a larger finger size compared to women’s rings. Very thin rings, such as a 2mm wide ring, are difficult to engrave, and the engraving shows very small and is hard to read. However, it can still be nice to have that little extra personal touch on your ring. With this in mind, you can plan out your engraving message. To get you started, here are some popular wedding ring engraving ideas. If you don’t have a lot of space, a popular engraving is to use a person’s initials, a date (such as your wedding date), or a symbol. Engraving the wedding date can serve a practical purpose, a handy reminder later on. The most popular engraving we see is “Forever & Always” or the alternative “Always & Forever.” Another popular engraving is “I Love You.” Some people like to engrave a name or names, or even nicknames, into the ring. An engraving I see from time to time is the very romantic “Mo Anam Cara,” which means “My Soul Mate” in Gaelic. Other engravings used include Bible verses. Typically people will engrave the scripture reference only, such as “Proverbs 3:5-6,” due to the limited amount of space available. The heart symbol and infinity symbol are popular. Our engraving machine can do a heart symbol, but unfortunately we cannot do an infinity symbol at this time. There are actually a lot of unusual symbols we can do, as well as special characters such as letters with accents. If you want to keep the engraving a surprise, that’s not unusual! Sometimes a couple will engrave the rings with a secret message that is revealed to the other person at a special time. 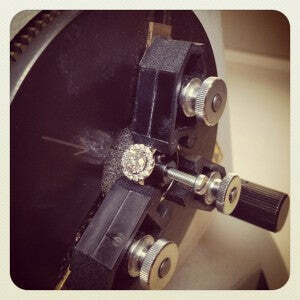 Generally, we allow for 15 characters (including space) for ring engraving. However, we can engrave up to 20 characters if space allows, for no additional charge. If you want to engrave more than 20 characters, it costs a little extra. We have engraved up to three lines of text on the inside of a men’s ring and it came out very well. Sometimes people just throw something in there at the last minute without much thought, but the ring engraving will be in there a long time, and this is a great opportunity to be creative and make it extra special and meaningful for just you and your partner.